Near the end of Meher Baba’s life, he approved the printing of the book 61 Questions and Answers on Meher Baba, which was printed in 1968. Included in the book’s appendices were spiritual transmissions by the Borup Group from Denmark that spoke of a coming global catastrophe caused by man, a tipping of the Earth’s axis, the Second Coming of Christ and a spiritual uplifting of mankind. The transmissions also spoke of Space Brothers coming to help mankind. His followers, however, found this too controversial, so after Meher Baba left his body, they stopped the book from being printed again. . . .
At the time of posting, I firmly believed that Baba could not have really wanted that weird channeled material to be published in connection with his own statements. I now realize how foolish it is to assume that I could ever fathom any of Meher Baba’s intentions. 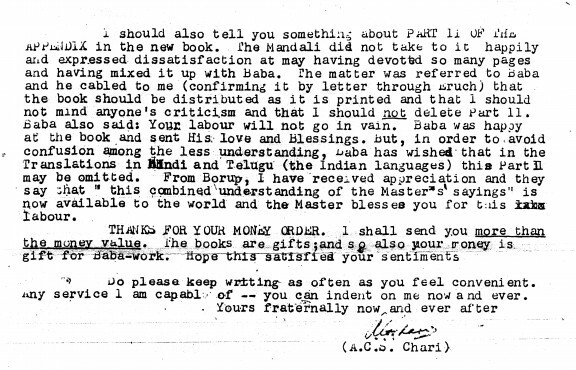 NEWS FLASH: Don McBride has begun distributing the booklet anew with the re-emergence of a letter from the publisher, Mr. Chari, written to Maya Andrau in 1968, confirming Baba’s allowance of the Appendix material (see below). As for the Borup group, aka the Universal Link, it still exists and has a website. As described by one chronicler of the sixties, “The Universal Link organization had been formed by a doomsday group known as the Orthon Cult, whose members believed the world would end on Christmas morning, 1967. To ensure they would not perish in the nuclear holocaust that would then engulf the world, cult members built an elaborate fall-out shelter in a field in Borup, not far from Hald in Denmark. Wooden walls, partitions, and a roof were constructed eighteen feet underground and covered with twenty-five tons of lead to shield the inhabitants from the deadly radiation of the blast. When the world did not end on Christmas Day, the cult split into different factions, but continued to generate the message that the end of the world was near, setting the new target date for spring of 1971 . . .” (Robert Greenfield, A Day in the Life, p. 188). Don’s letter follows, with an image from actual Chari’s letter, and the Appendix text itself, Part II, pages 29-50, which is offered in the interest of controversy and strangeness. I am also adding (Oct. 4, 2013) part of a letter from Chari received by Jean Brunet (now Jean Ludwig), explaining his publication of the Borup messages (scroll down to the very bottom to see it). I have taken upon myself to reissue “61 Questions and Answers on Meher Baba with Appendix,” by Society in West Bengal for Meher Baba, A.C.S. Chari. I’ve made copies of an old copy I had—underlines and all, reproduced in full (pages 3-53). It seems to have become quite a controversial publication in the ‘Baba world’—it revolves around Appendix part II, page 29. This publication, dated 1st October 1968, was freely available at the Meherazad and Meherabad libraries, in the ’70’s. And the Mandali accepted that it was approved by Baba (as others will attest also) even though there was some far-out content in part II. After the ’70’s, when questions and disbelief were expressed to the Mandali buy visitors (Westerners) the publication became very scarce. I had some reservations myself, but the content I found extremely positive and hopeful, and ‘rang true’ in my heart. “…I should also tell you something about PART II of The Appendix in the new book. The Mandali did not take to it happily and expressed dissatisfaction at my having devoted so many pages and having mixed it up with Baba. The matter was referred to Baba and he cabled to me (confirming it by a letter through Eruch) that the book should be distributed as it is printed and that I should not mind anyone’s criticism and that I should not delete Part II. Baba also said: Your labour will not go in vain. Baba was happy at the book and sent His love and Blessings. But, in order to avoid confusion among the less understanding, Baba has wished that in the Translations in Hindi and Telugu (the Indian languages) this Part II may be omitted. From Borup, I have received appreciation and they say that ‘this combined understanding of the Master’s sayings’ is now available to the world and the Master blesses you for this labour. I find it hard to believe A.C.S. Chari, an Advocate, who had a long history with Baba, meeting Him in Nasik 1932, would lie to Maya Andrau on this matter, and with Baba with us (having finished His seclusion work). Perhaps, now we can read this publication in a new Light, weaving together what is said by Baba in Part I about His manifestation—a rather Suddenist view—and Part II. Hope this clarifies and elucidates as we grapple with the mysterious Breaking of Avatar Meher Baba’s great Silence, and through Divine dispensation, one day . . . we get “the cure”! 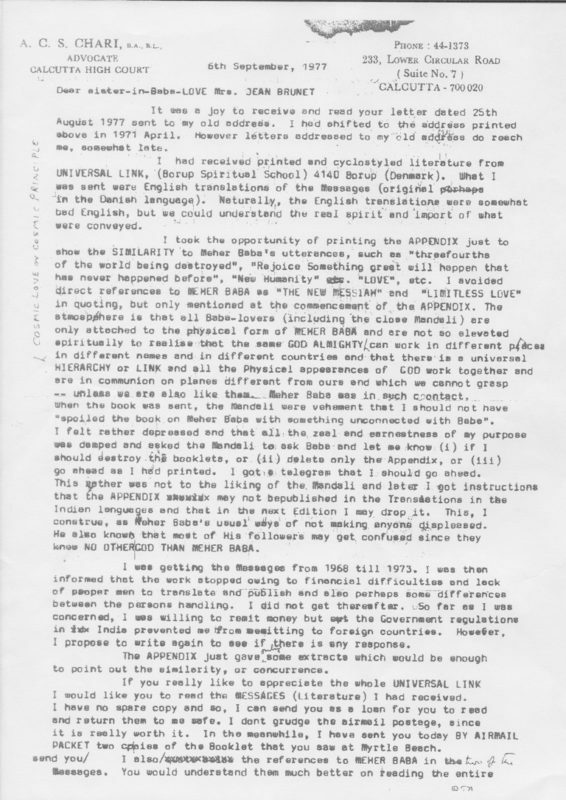 It is of great significance that, simultaneously and concordantly, in that period (Christmas Day 1967 to 2lst May 1968) SPECIAL MESSAGES were revealed and published for the general public from “UNIVERSAL LINK,” BORUP (Denmark), and the following few EXCERPTS therefrom—(the translations in English thereof)—are very instructive and confirm the utterances of Avatar Meher Baba (broadly, though not in details) to a great extent. In those messages revealed by and published at “Universal Link” (Borup), Meher Baba is referred to as LIMITLESS LOVE and THE NEW MESSIAH. We have now. … a Cosmic Being who operates and communicates all over the Earth, messages which confirm and fit into each other, stating when boiled down: “I am He,” “It is Now,” etc. He operates under various names: Truth, Limitless Love, Orthon, etc. He never uses His real name, but intimates rather strongly that He is CHRIST.
. . . We have a COSMIC BEING who intimates He is Christ. He asks for certain things to be done in order to fulfil COSMIC LAW prior to His coming, and in the performance of these things He brings about a sequence of events which step by step fulfils the code of recognition which has, in fact, been put down in ST. MATTHEW, chapters 24 and 25, and other passages, where the “Latter Days” are described. The messages are received concordantly—often in the same phraseology, but differing in other respects in various parts of the world in accordance with a consistent principle in the outer world, namely: giving whatever is necessary, whenever necessary and wherever necessary. Soon, the great world events will take full speed. Do not let panic seize you. This is finally and absolutely My will. Take courage — be confident, everything is in My hands. Everything has been carefully prepared for this course of action. As the events take speed, great suffering will occur. This is necessary and must not worry you. . . . My plan is perfect. . . . Everyone will be placed in the position where he spiritually belongs. My house has many mansions. I have room for everyone, but sometimes find it necessary to undertake certain gradings. The principle of the spiritual hierarchy must be grasped and fully understood. This is urgently necessary in order to create the spiritual reform now to be introduced on Earth. . . . Many wondrous things will happen — things that human beings today would be unable to grasp; and because they cannot fathom them, they do not dare believe them. How­ever, do not worry! We know exactly what we’re doing and what you need. Everything and everyone will be changed so suddenly that no one will recognize anything or himself from one day to the other. Things will happen on Earth which to many will appear to be cruel but which to us are quite a natural process. You have spoken of purges; we speak of spiritual purges. When we speak of spiritual purges we mean spiritual shifts — this you must understand. Nothing that has been created will be lost. With regard to the law of hierarchy, it is absolutely essential that you understand its function; absolute unselfishness, absolute devotion and absolute altruism is the universal law on which the future is to be built. Yours is not the only inhabited globe in this solar system. As a matter of fact, more than people dream of are inhabited — more than human science will admit. There are more planets in your solar system than your scientists will acknowledge. Meet the future confidently. I cannot say this too often to you. I realize that it’s difficult to fathom a change so radical as the one now about to take place. Not until humanity has been brought into a situation from which no return is possible will it take heed and understand. As a matter of fact, it must be brought into the situation where it has burned its own ships. We’re joyously anticipating the end of the operation. What is about to happen places serious burdens on our shoulders, but we gladly under­take our tasks and we do so voluntarily. This is a helping hand from us to you, but we do look forward with enormous joy to the end of our work and to the day when the happiness and bliss which will flow over you will be an established fact. . . . Our work does not involve any special group of human beings, but the Earth’s total population. We are only interested in those who are responsive to our messages, for they will understand the epoch to come. Those who do not wish to study our work themselves must take the full consequences. When I say they must take the full consequences, I ask you not to misunderstand me. Just because people refuse to accept what we offer them does not mean that they are lost. I have said before that nothing of that which has been created is lost. But it is to be understood to the effect that when our help to the world takes place these people will be under an enormous physical and spiritual strain because they have not prepared themselves. . . . It is a very great event that is about to take place. I can express it by saying that it is really a new birth of the world. I want you to know we are rejoicing — we are rejoicing, we are re­joicing and we are rejoicing in what we are going to do for you and your fellowmen on Earth. I want you to know that this is a message of great joy and that there is no reason to be down in the mouth. We are joyously anticipating to show you what we have achieved and we are looking forward to transferring to your Earth what we control. We are rejoicing in the knowledge that we shall create the buildings that we are able to construct and we are rejoicing in giving you the way of life that we have. Rejoice and tell your fellowmen that you are rejoicing and that we are rejoicing and that they may rejoice in the wonderful anticipation of what is going to happen. The hour of our operation on Earth cannot be revealed to mankind. The day and the hour are our secret and will remain so until the moment we arrive. . . . We are stingy with regard to dates and hours. The time for our operation is not even known by those who are in the midst of the operation — only I know the exact hour. This holds true also of the prophecies. Do not quibble over dates. When the day and hour must be concealed up to now, remember, we have not given any approximate hour in the prophecies either. For this reason there have always been miscalculations and that is why I shall be able to come like a thief at night. We work so precisely that it will be a matter of a second’s accuracy. . . .
We shall do something to Earth undreamed of by mankind. . . . What will happen to the various continents I cannot tell you, but great changes will take place, that is quite clear. This must not worry you. Everything we do will be done on the principle of love and grace. We are coming to help — not to destroy. We master the universe completely. Later, Man himself will acquire a technique and knowledge that will enable him to move about in the universe — I have said so before, but simultaneously he will acquire knowledge and technique that will make it possible for him to do the things that we now do. Everything that mankind has learned throughout the ages about the Second Coming of Christ to Earth will take place. The prophecies given to Man throughout the ages will come to pass. Many wondrous things will happen to Earth and its inhabitants. . There will be understanding. Full understanding gives access to eternal life. It is realization of life that causes life to become eternal. Mankind has much to rejoice over, no matter what will happen to each individual in the present situation. Those who are to stay here will have a new kind of existence and those who do not remain here will continue their existence elsewhere. Many of you belong to the category of people who will undertake the spiritual guidance and power on Earth after we have helped, for, after we have helped, you will be permitted to carry on. It will not be us who are to govern the Earth — that would be a breach of the hierarchical law. Man must develop himself in future but I say unto you: you will have one thousand happy years on Earth. Rejoice! I cannot tell you this too often. The life and the way of life, the joy and the happiness, the harmony and the spiritual sublimity now coming to Earth will outshine everything hitherto manifested on Earth. We will help you by the means at our disposal and we will help you with our intelligence. The spiritual contact will always be intact and we will come to see you often and again. We will guide and enlighten you. You will see things done by Man which you have not seen before and you will see Man develop in a way that he has not had time to before. Art and science, literature and music will flourish — yes, flourish in such a way that they will actually be more commonplace than potatoes are today. When this is said, you will realize that it calls for a spiritual maturity that must never fail. If it fails, backsliding will be the result. What Truth is and what Truth is not — that each individual human being must find out for himself. This is the difference between Man and the animal, this is the decisive difference in the hierarchical class. Man was given his absolute free will, but for this reason he must also of his own free will come to his God. You must never force anything on anyone, you must never press anything on anyone. Only through your own ex­ample may you influence them. Verily I say unto you: if you try to press my words on them, you will be pressing them away from me. But be of good cheer — I am much nearer than you think, time is full. Woman is just as divine as man, and man is just as divine as woman; mutual respect and mutual understanding must also here be absolute and complete in order to ensure fulfilment of True Love. True love is some­thing that goes out to everything and to everyone. If one really could understand what life is and what life stands for, everything would seem different. . . .
From what I have told you here, you will also begin to realize the essential thing — the goal you are to achieve. You have seen the picture of this: Limitless Love. It is Limitless Love that is to flow from you — it is with Limitless Love that you are to meet your fellow human beings — it is with Limitless Love that you are to come to Me. And, if you send out Limitless Love, Limitless Love will revert to you. . . . It is Limitless Love that must be our goal — it is in Limitless Love that we must walk together — it is this Light which will henceforth shine over the Earth. Limitless Love is the root of everything good. From this root can only grow Love — a Love that will grow directly into us. . . . The key is simple and common, but it is made of gold. Its name is simply: Limitless Love; and it will open up anything. If you live according to these words of mine, then you will understand what life is really about. It is quite another matter that this message of joy — the message of My Coming which is NOW just about to take place is given to mankind in the midst of most desperate times lived through by Man …Many people will perish, but millions and millions will remain and it is for the sake of these millions that we are coming, so be of good cheer and turn your thoughts to us. . . . I have taught and explained to you that life is eternal. I have said that nothing of what has been created will be lost and that there are many chambers in My Father’s mansion. . . . Do not be worried. Every person entering the New Age may feel some loss and longing for a short time, but he will quickly get over it. He will get over it at the precise moment when he or she realizes the course of events they have just experienced. Then all sorrows will disappear and confidence and cheerfulness will replace them. The people who are not qualified to rejoin them will be replaced to other parts of the universe where they will be allowed to continue their lives and doings exactly as they did here. Therefore, once again: be of good cheer in the sorrowful days now coming — they will last only a short time, then Phoenix will appear. This will be My Coming, the Second Coming of Christ to Earth — it will appear as a message of joy written in flames across the sky for you to see. . . . The greatest error committed by Man is that he has struck the microcosm — he has split the atom. This is not allowed, it is a breach of the Law. One strikes in something created by God, one breaks down something created by God — this one may not do as one may not kill another man; for, verily I say unto you, he who kills another man will immediately be held responsible for this killing. I have said he who takes up the sword shall himself perish by the sword and when mankind strikes the microcosm, all of humanity will be held responsible. You have heard it said: “In My Father’s mansion there are many chambers.” This should be understood in the way that by far most of the planets in the universe are inhabited by living creatures of one kind or another. However, higher life is reserved for certain planets which have been specially chosen. Do not by any means believe that Earth’s Mankind is placed particularly high measured by universal estimation. Earth’s Man has achieved much, but not until now will he begin to live as a human being. Up to now he has been living as an animal being. He has been living in an absolutely animal ego and has never wanted to look beyond his own self. That is why he finds himself in the situa­tion that he is able to exterminate himself globally. Simultaneously, however, Earth has managed to bring forth a crop of human beings who are sufficiently spiritually developed to make the leap to the level that is now to come. This is why it would be against the Law if Man were to wipe himself out globally, and this is why help is now under way. The Law is carefully observed in every respect and help has been asked for, but the difference between help and interference is not only fine as a hair, it is microscopic fine and for this reason certain events must have happened on Earth before we can manifest ourselves physically in such a way that all of humanity will be able to perceive us as they perceive motor-cars, aeroplanes and the like. After My Coming to Earth has been fully manifested — physically as well as spiritually — the Earth will ascend from one spiritual level to the next — it will go up one rung on the ladder of the Hierarchy. This step upwards will condition an entirely new way of life than one that has hitherto been possible on Earth. . . .
Our chain on Earth has now been completed and the spiritual force which is to manifest itself on Earth with regard to the people who are to go on in an entirely new light than they have hitherto known, is now beginning to come. It is something which people in general do not particularly notice. We simply influence people in a purely spiritual way. We have the methods and our own way of doing it . . . as our force manifests on Earth and spreads more and more among men who feel this force and either intuitively, impulsively or intellectually heed the call coining to them, well — then the rest going the other way will be more and more desperate. This spiritual struggle thereby ensuing will be no mere trifles … even if you use your whole imagination, it will not suffice with regard to what you may expect. Mankind’s troubles will be caused by Man himself in the form of atomic war. The damages on Earth will be enormous, but our operation will prevent the final catastrophe, global extinction. I bring life and hope for the future to mankind — that is why the message of My Coming is a message of joy to mankind. Simultaneously with My Coming the Millennium will be introduced. The Kingdom I represent will now come to Earth and Man will experience henceforth a way of living and a way of associating with his fellowmen which he has hitherto not known. The change will be so radical that NOTHING of what exists today can survive. We will reconstruct the Earth in a way that will condition entirely new living possibilities than those known to Man today. No­where will slums be found. The monetary system will disappear and nobody will know want and misery. Everything will be changed to peace and harmony. . . .
With regard to the Millennium it should be understood thus: Man will be given 1000 years in which to bring himself to the same spiritual level on which we stand, He will then control his body absolutely, including his brain. He will be able to — in a purely spiritual manner — make stones fly through the air or, for that matter, make spaceships fly to wherever he desires — simply through the force of thought. Telepathic communication with people over vast distances will be quite common and Man will be aware of his soul and will be able to use it. When Man uses his soul in the right way, he will appear as a duality exactly as we do. To be able to appear as a duality is of enormous value. It implies that one can physically be doing one thing and be occupied at spiritual work somewhere else. Not everyone will reach this stage equally soon and for this reason another sorting will be necessary in 1000 years when the next examination will have to be passed. This sorting will, however, take place full physically and will not involve any kind of death. I have told you before that events will take speed in the Far East and from there develop over the Earth. Terrible things will happen and neither should you think that we find it exciting to contemplate these tremendous sufferings which Man — plainly speaking — has brought down upon himself. But we know how the whole thing is going to end; and now, you also know how it is going to end. I have promised you a life and a way of living which will be of such great inspiration to mind and soul that you will henceforth live absolutely happily. Therefore, I bid of you in the time preceding this: be of good cheer, turn your thoughts away from what is happening around you — turn your thoughts to us, confident that we are with you. Do not allow outer things to disturb your inner mind, I said. Turn your thoughts to what is coming — towards the final and happy result of the operation what I stand for. TURN YOUR THOUGHTS TO GOD. It is an entirely New Age you are facing. It is entirely new con­ception of life and it is the pure joy of living that is now coming to humanity. For this reason the reconstruction will be as play — and, with enormous help from outside. Simultaneously, we will place Limitless Love instead of limitless hate. I have told you, this is a message of joy, and however serious things may seem, it is a message of joy. . . . In future, the world will be governed from one place and the Earth will only be governed by people who have achieved full spiritual under­standing. The world will no longer be governed merely by words, the world will be governed by the demonstration of Limitless Love flowing out from the people set to govern. This is the decisive difference between the present form of government. When I talk of a World government in this connection it will not be a government of the kind known to Man today. It will function as a gigantic information-bureau, so that it may lead and guide people to the full understanding. Only from the day when all people walk in Limitless Love can we rightly say that the Second Coming of Christ — My Second Coming — has been accomplished. No man can know the day or hour when My great Universal Reve­lation will be enacted. . . . But I told you already 2000 years ago that a date would be given and yet I would not come. If you had read your Bible a little better, you would have remembered the story about the bridegroom who did not come at the time he was expected. Be watchful so that you are not found without oil in your lamps. I have told you I will come with suddenness, and I shall be coming soon. A major world conflict will herald the last stage of the Universal Progress. In the meantime, general world conditions will show evidence of a leading up to the introduction of a nuclear device that will bring about the final human level episode. The major conflict I speak of will be between nations and it will be most sudden. A war will start in Asia and spread to Europe. … A human press-button device will be used and, simultaneously, with the pressing of the button, instead of disaster, the Universal Revelation will occur.
. . . The third world war is karmically determined by the second one. What they have done, in fact, is that they have prevented various episodes in the fifties and the early sixties from growing into something bigger. They have accumulated earthly karma, as it were; they have postponed or put off the final war between the East and the West until a time when atomic weapons are big enough and numerous enough, the automatic warnings systems effective enough and the tension of the world situation strong enough for the war to be explosion-like. Once it comes, it will be a matter of weeks, may be only days, before they reach a point of “no return” and the rescue operation from Space can, in accord with Cosmic Law, take place. This is how the “Latter Days” are being shortened. Think deeply at this time, examine all that has happened. Search your heart not only for Truth but for the impregnable LOVE I have taught you. Allow this Love to grow amongst you all so that your channels of thought and reason can remain clear when the moment of Realisation confronts the Universe. . . . It is for you to remember that My Coming will be in the next second and without a moment’s warning. Up through the ages, very few souls have learned the lesson and balanced their Karma so as to advance to the next Hierarchical level. The majority have reincarnated on Earth over and over again, finding it more difficult every time to break the circle. . . . However, Life is eternal and everybody will sooner or later reach the next level and even higher. But the lessons must be learned on each level. Some souls will only learn the hard way, but everybody has the possibility of seeking within themselves, for the answer is there for all who seek. . . . In the present situation, where man has reached the end of the broad road of destruction, help will come from above as a gift of grace so that instead of disaster, large parts of mankind will experience a spiritual initiation, an uplift into the next level, a resurrection in the flesh into a glorious NEW AGE, the Kingdom of Heaven. Every single individual will have the offer right up to the last minute, but he must decide for himself whether he will accept or miss this chance of making an enormous jump in his evolution. . . Such an offer is truly a message of joy in an other­wise hopeless situation created by man himself. So let us rise above doom and gloom thinking and seek the peace within. Let us rejoice in praise and thanksgiving and try to spread ever more Love and Light to others so that as many as possible may have acquired a wedding gown (aura) of the right colour by the time the Bridegroom arrives. The principle of killing must now be abandoned entirely and totally. When we speak about the principle of killing we speak about it in the full sense of the words. Nothing that has been born to life upon Earth must ever be killed — on no account. . . . To God, all life, and every single life, is sacred, for all life has been created by God, and what God creates He also consecrates at the very same moment. . . . God is almighty, God is the only one who has the power, strength and intelligence to govern a universe as complicated as the one He has created. God would never let one single man down or leave him behind, bereaving him of his chance to attain higher levels of evolution. Such would never be the case. Therefore, the Divine Power will now come to Earth to help man out of the consciousness he has manifested up to now. Through the Divine Power man will attain a re-creation and a re-birth. The spirit of man will be lifted up and ascend one step up the hierarchical ladder: a mutation will lake place in man’s consciousness. . . . We will bring with us a power and energy which man does not know. This energy will be used in helping man in order that large parts of humanity may survive the situation they will have to face. . . . We cannot interfere but we can help any individual who helps himself by turning his mind to God. Recognition of the concept of God at the very bottom of a man’s heart and mind is what is sufficient to ensure the help that will result in spiritual mutation. No discrimination between races or nations will occur. They all belong to God. Therefore, to us, there is no difference and no discrimination will occur within this operation. The Second Coming of Christ to Earth will be a turning point for man’s consciousness. The Christ-Consciousness will be extended to Earth in such a way that the teachings of Christ and the Spirit of Christ can now be lived on Earth. The principle of Limitless Love will take the high seat and people will live together — as true brothers and true sisters, and no killing will ever take place again. . . . The return of Christ means the understanding of the life and spirit of Christ on Earth, such as it was manifested in true and limitless love, but still, with the full use of intelligence; not accepting violence towards others, but ready to forgiveness when facing it oneself. . . I shall come and separate people as I have told you; and I shall separate them into several categories. Yet nobody will be lost — but not all people will attain Christ-Consciousness. Life is everlasting, and life runs in cycles. The Christ-Consciousness ex­tended to Earth will change the Earth, including all matter, so that even the physical matter of Earth will be lifted up to a higher level. . . . . I have promised man this Second Coming of mine already 2000 years ago, and I told you then that nobody knew the Day or Hour but God Him­self. . . . Then, a New Age and a New Life will begin for man on Earth. . . . God Almighty is in control of you as well as of us. What is going to happen now is God’s Absolute will. . . .
Now we have reached a time when all the peoples of Earth are to be united in the light of a higher philosophy, and all religions should co-operate in order that full understanding may come to any man, no matter which religion or philosophy he may have followed or worshipped so far. Here, modern Science has an important part to play. Modern science in all fields has given Man a knowledge of the microcosm as well as macrocosm, which he did not have previously. It brought Man to an understanding of the structure of the universe as well as of matter — on Earth and other planets in the universe. This understanding when mated with the Christian teachings (that is, Christian Teachings, understood correctly) will give rise to a complete and perfect understanding of life and the laws of life. The gulf that has existed on Earth so far, between Science and Christianity, will now be filled, this gulf will now be bridged and scientists will be brought to understand and realize that the Christian teachings are valid to an extent far exceeding what is true of the teachings the scientists themselves have been able to give their fellowmen. This, in its turn, will cause Science to leap forward in a way it has never done before. The ways of Science and its speed will change. Only with a help from us will it be possible to fill the gulf between Science and Religion, and not until human science is given a proof of our existence and of our technical, physical, chemical, and mathematical knowledge will they yield and start seeking along other paths and seeking by other means than they have used so far. This will be necessary in order that Man may advance further; for without this gulf being filled and without this bridge being built, Man would have no chance of further life on Earth. . . . Hereby the economic structure on Earth will change completely and totally . . . the situation was always that a minority possessed the whole power, and by far most people had no influence whatsoever . . . the technical evolution came about, . . . but not for the better . . . they forgot that men are Men, that Man was created by God, and that they could not treat — and cannot treat — their fellowmen as they like, whether they intend to use them in factories and thereby exploit them with a view to financial gains; or they use them as slaves — it is all the same and it is equally wrong. The Christian philosophy and the Christian teachings were never understood, and therefore, today Man has reached a point where a handful of individuals only decide what is to take place on Earth, while all the rest have no influence and cannot obtain any influence. . . . The great religious philosophies will now get together and become fused into a unit. Thereby the economic structure will change and this, in its turn, will cause people to be given full liberty. Every individual will he regarded as a Man, and not a slave in any way. The economic situa­tion being today that the Earth has been divided into different spheres of interest and power, fights will arise — as attempts of retaining these spheres and these interests. War on Earth today means global extermina­tion of all life. They will go through with this fight for power, because they are standing in a struggle for power, internally and externally, and there will be no possibility of breaking off this trend of events which has been started off. It is at this point and at this time that we will come from Space to Man on Earth. Now is the time for our coming and we approach all the people of Earth in order to make them get together, united in one true religious philosophy . . . we shall come . . . and once again give Man a spiritual mutation. We are able to give this mutation by purely chemical means. . . . Today we will — by organic chemical means — give such a mutilation to Man, not to the effect that his physical body is changed, but to the effect that the structure of the human brains is changed. In future, the whole of the human brains will be able to function, and when it is used at its full capacity, and with the new religious philosophy fully understood, Man will acquire a knowledge, a wisdom, a way of life, and an ethical attitude towards one another, not hitherto attained by Man. . . . God being in charge of everything, and God being the power which holds everything together, in the universe as well as on Earth, it is also the God-power, it is also God who is to decide when this should take place. . . .
Every individual life in the universe has got a direct connection to the Creator, to God, to the God-power. . . . We have told you we are brothers from Space who are coming, and brothers always help one another. We shall come as brothers to you, in order to help you. However, it will only be possible to help those who want this help themselves. Those who will accept and understand can have the help. All others must learn to live their life by living it the way they do today and thereby reach to an understanding — the understanding that leads to the mutation which we can give to Man. This time the mutation will not be given on the Earth like in the days of old, it will take place outside the Earth. Large parts of humanity will be snatched away from Earth in order to obtain this mutation — and then return to the Earth again — to an Earth which we have changed in a way, advantageous to Man. We shall come with love and we shall come to be met with confidence. We shall come to all religions of the world, and to all outlooks on life. We shall come to all people, we shall come to all living beings, animals as well as humans. Evolution on Earth will run faster in the future. The higher a consciousness is elevated, the more it understands and the faster will run the evolution. When Man is liberated he will be able to acquire a way of life that will give him time to work with himself and within himself. Thereby, he will also be able to handle and work with physical matter in another — and much better — way than he has known hitherto. This means that Man in another 1000 years will be able to reach a form of life which is entirely different from the one he has got today. When speaking of an entirely different form of life, I mean that Man shall then no longer live in flesh and blood, but purely spiritual. This spiritual existence will condition also an entirely different way of life; but it will take 1000 years for Man to reach that level. Consequently, the process of evolution which Man will now enter will run about 60 times as fast as has been the case up till now. Following the principle of killing, Man has now reached perfection, for Man has found the enormous forces which God has created in the microcosm and macrocosm, and uses them the negative way. But, at the same time, large parts of mankind have realized that the principle of killing must be abandoned and something else put in its place — something higher, something ethical — and a change of mentality must take place on Earth in order that Man may advance further. . . . Because of this spreading realisation, and because so many individuals have reached it already, we can now again come to the Earth — again helping the Earth at this critical point of the history of mankind. . . . No mutations occurred during the 4000 years from the days of Moses and up to now. For the first time in the history of Man on this Earth, Man will now be given a real mutation, a mutation which will enable him to understand God and Cosmos; and therefore, the upheaval and the revolution — the spiritual revolution — which is now to take place will be of much greater impor­tance and have a much larger scope than the events that took place at the times of Moses or Christ, even if we put these two together.
. . . You may mention your scientists, or whoever you wish, for they have got no understanding of that which is now to happen, and they have got no understanding of true life. When speaking of true life, I refer to the life that Man ought to manifest at the present time, but which Man is unable to manifest, because Man has not been able to abandon the principle of killing. This is where something is wrong, this is the rock on which the whole scheme is wrecked for mankind. This I have explained to you, and this you must know, — and in your minds you must reach to the point where you never ever allow yourselves to be upset, you must never allow yourselves to be affected by outer events. . . . Do not allow outer things to disturb your innermost being — never. . . . Peace and harmony you must have within — . . . you were told that time is running short, and I can only add that time is running very short for Man on Earth now. Only a few days are left before it will happen. . . . Through all ages Man has been told that if he follows this and that principle, this and that will happen, whereas by following such and such ways, such and such will be the consequences. I have told you it is the Law of Karma, the Law of Life, that creates the different situations for mankind, because Man in his own mind creates these situations, and therefore, they occur. The contact you will be given from Space will cause you to be totally changed, and when I say “totally,” I mean totally. The law . . . is to be fulfilled to the letter, by us as well as by you . . . the principle which will now be established on Earth — the principle of Life which Man is to live, and to live by, in future. It is God’s Law — the law that Man will not accept. The physical laws they will accept — as long as they can use or abuse them according to their own liking, but the spiritual law they have completely forgotten and overlooked, and that one is the most important law. Have they got that one, they will also quickly add the mechanics of the whole universe to their knowledge, and then it is that the sciences will leap forward; but this leaping forward of the sciences is a thing of secondary importance as compared with the spiritual mutation which must take place. . . . When you talk to people and when you meditate on these things, you must never never get the idea that you should under any circumstances defend or justify or interpret these messages. That is not your job; but you can confidently pass them on. The Truth and the Law, God’s power and God’s nature and my work here on Earth, need no defence or explanation; this is unnecessary. Man will acquire a new way of life and new rhythm of life, this I have ex­plained. . . . Since God’s power and the very nature of God is also a kind of vibration, it is logical that only when the God-power comes to the Earth can the vibrations be changed. Otherwise it is not possible. Everywhere on Earth Man has today reached a point where he can get no further. The economic systems are collapsing everywhere. By issuing hard decrees they try to maintain power over their fellowmen, through economic pressure and through monetary systems — this being true of the East as well as of the West. Therefore, the economics to be found on the Earth today is closely connected with the principle of killing, and because the principle of killing is now to be abandoned, because the principle of killing has reached perfection, the economic system will also be changed totally. Because everybody will attain the attitude, mentally, that every man is an absolutely free individual over whom you have got no rights of any kind, and who should be left to live his own life in absolute freedom — because a man’s life is something that has been given absolutely free to him, as it has to anybody on this Earth — when every­body attain this attitude in their thoughts and with all their soul, the monetary system will disappear.
. . . The principle which Man lives — and lives by — is an inheritance and an appendage from the animal kingdom. The animals must have a flock leader, and within the animal world, this is the right of the strongest. This is true of mammals, birds and fish. I have explained that they have lived by the flock, they have howled by the flock and people have killed by the flock. This flock-instinct must be absolutely abandoned. . . . The highest form of life to be found in the animal kingdom is the apes. All groups of monkeys and apes have got a dictator, all of them. This kind of dictatorship was carried along into the human level, the kingdom of Man, and it developed into the system of slavery, in the most horrible way for Man. People made themselves masters and judges of their fellowmen and took their lives at pleasure. Later on, when wars, revolutions and the great periods of diseases, etc., that smote mankind made Man think along other paths than the one manifested by the ancient people, a tiny spark of spiritual understanding was lit — an awakening understanding of the other fellow’s worth and thereby a slow change of the system of slavery, the monetary system (as it is known on the Earth today), was introduced. This did not change Man’s life and circumstances radically. Just like in the past, when people were pressed with laws and decrees, and a slave was doomed if he left his master or revolted against him, so are today all men on Earth, outside the classes who control the Earth economically, doomed in the greed of these classes and their lights among themselves for power, because these classes today master the principle of killing to perfection. At the same time, the technical knowledge has now reached a point where the slave can be done without, so that he might as well, very conveniently, be exterminated. This is men’s attitude towards men on the planet that you inhabit, and in the spirit that you manifest. . . . There has been no shortage of warnings, and the first great warning came to mankind in the first great war in this [20th] century. At that time Man began to suspect that future wars would be impossible. Mankind was given a picture: total power over people was given to men. The price was about 65 million lives, and several hundred million mutilated human beings. . . . But this was not enough either. And it was said to Man: “Turn round while there is still time.” But Man had to be brought all [the] way out, as I have said, to the point where he has burnt his ships, before he will listen and reverse his ways. And to make Man abandon the principle of killing is considerably more difficult than making him give up the principle of sacrifice and the system of slavery. Man himself has created the situation in which he finds himself. It is our job to prevent that this God-created Earth be destroyed — and we will prevent it. God be with you all, and with all life. Now I am once again giving a message to the Earth, a message that will revolution Man’s thinking — and my coming again will revolutionise Man’s life and doing. I promised I would come back and separate the sheep from the goats; they had no chance of understanding how this would be done. I have taught that we will come to mankind with Love and with God’s spirit. Because we obey God’s law and never, at any point, deviate from God’s principles and God’s plan with life, we will under no circumstances interfere, but help where help is necessary, and help those who are in need of help. God does not punish anyone, but God’s law is created so wisely that when a man — or mankind as a whole — goes against it, the Law will return the acts that have been committed, right back upon the man — or mankind. . . . My Second Coming to the Earth, which I predicted 2000 years ago. will lake place, full physical — and along with the Host of Heaven — exactly as it was said. I said 2000 years ago: “The end of time is near and this generation shall not die out before the end of time.” This should be understood on the principle of reincarnation. . . . very, very few people have succeeded in freeing themselves of their reincarnation, succeeded in freeing themselves of the bonds in which they have tied themselves, spiritually. . . . The human race now faces its redemption from Karma; and when I say the human race, I mean those who have acquired sufficient mental matu­rity to ensure them the spiritual mutation I have taught you about. When I said that, the end of time was near, it was to be understood on a cosmic time-schedule. Now the end of time is not “near” as seen by us — the time has come; and it has elapsed for those people on Earth who have failed to understand the school of life in which they were placed. . . . Mankind faces a war. . . . Man’s knowledge is now so manifold that slaughter will be brought to perfection. If mankind were not given a helping hand, spiritually and physically, all mankind — nay, all living beings on Earth — would he lost. . . . I am referring by “lost” to “the loss of the New Life” which is now about to be established on Earth. This New Life will be given to those who listen to our message, heed it, and follow us with pure hearts. All others will be removed and will continue their lives elsewhere on other planets. They will not be taken to planets in this galaxy, but to planets outside this galaxy. . . . The Earth is the weakest link, spiritually speaking, of this galaxy to which it belongs . . . and when the weakest link is raised one step, then all the galaxy’s con­sciousness will be raised one step. This is what is about to happen. This is what faces you; this is the Second Coming of Christ. . . . Everyone must walk in the light which to that person, male or female, is Truth. . . . One must not influence anyone even if one feels that one knows better. . . . Everyone must follow us by his own free will. Man is placed so high on the ladder of life that he has his own free will . . . this should be made very clear when telling about our message. The spiritual school (in Borup) has been held . . . in order to bring understanding of what is to come to mankind, in order to make it pos­sible for people to understand the course of events to be lived through by mankind — a course of events which cannot be called good in the beginning (because Man has not understood the law of life), but which will end in my Second Coming. I shall be coming to mankind myself, full physically and with the Host of Heaven as has been said, and then the Earth — its consciousness and the people living on it — will be elevated with regard to spiritual consciousness, so that they may better understand God and what God is — because we are now coming closer to one another — . . . you will be able to acquire a considerably better understanding of God, what God is, and what God stands for. Some idea can be had of what is to happen . . . you may better understand the enormous operation called the Second Coining of Christ. . . . I have said that the Earth will stand still for one second, and the Earth will stand still for one second. After that it will revolve — the Earth will simply tip over, thereby altering the surface entirely. I have also told you that while this is taking place, great, great parts of humanity will be evacuated up into huge space-ships. You know about the size of these space-ships — their enormity. But I would like to remind you that when man returns to Earth if will be void and barren. No human being could manage if he were not given further assistance. I now ask you to imagine and think about the enormous supplies that are already in store for you — supplies sufficient to last for nearly a year for the people coming back to the Earth. Now you will realize why I call this a message of joy. It is a message of joy that help so enormous will be given. . . . This help is being given in order that mankind will understand how to live life in peace and harmony and in accordance with the Law of God hereafter — in order that man will abandon the principle of slaughter, so that, as I have said, no animal or person will ever suffer injury. An entirely new understanding must spring forth in the conscious­ness of man. It must emerge so suddenly that it takes the form of a spiritual mutation. This spiritual mutation will simultaneously cause science to take an enormous step forward . . . to a knowledge to be attained by man so great that Man in his wildest imagination today cannot conceive it. . . . In fact, every person will become a scientist — and women will make no exception then. Woman will have her freedom in an entirely different way than she has hitherto experienced. There will be no need of suffragettes — there will he no feminine cause to fight for. Everyone will respect one another — all will be equal. Spiritual work — may I say, spirito-scientific work — will take the high seat, and this will cause Science to leap forward in a way not before known to mankind. . . . Simultaneously, Man will be able to move about in Space. He will go far and deep into Space even, for Man will be admitted to the entire galaxy to which he belongs. This means that Man may visit thousands and thousands of planets which at the present time are far ahead of the knowledge today possessed by Man. This again means that Science will advance even quicker — will jump ahead even quicker. But I ask you to bear one thing in mind: It is in Man’s mind that all this is created. For this reason, it is absolutely essential that Man has a pure, an open and honest mind, that he understands the universal laws, God’s laws, and that he under­stands what God is. The first schooling Man will acquire will be given in Space in the period of time from the tipping of the Earth to Man’s return to Earth. This is a message of joy which Man can understand. This is a help given to Man . . . when one lives according to the Law of God, the stronger link will always help the weaker — and now help will be coming to a weak link in this galaxy (viz., the Earth). . . . Earth will acquire an absolutely new consciousness. . . . “Thy Kingdom come” is now to be ful­filled. . . .
We stand before a gigantic baptism, a new baptism of mankind. It is a baptism conditioning admission into a stage of the hierarchy where man has hitherto never found himself. This baptism does not require water but fire . . . fire will be used as the cleanser. . . . The Earth will be purified in fire, but he who hears the Voice and he who heeds the Voice . . . will be elevated into the air and from there witness what will happen to the Earth, which will be cleansed and purified in fire; thereafter he will descend to Earth and continue his life in a new spirit and with new knowledge and new understanding — in daily communion . . . with God; truly, it will be God’s Kingdom now coming to Earth.
. . . When you look about you in Nature, you perceive infinitely many life-forms manifested on this Earth on which you walk. Every single form of Life represents some part of God. Everything you see has been created by Him, by His force and His spirit. When God desires that some life or other should go from one form to another, it happens suddenly through a huge upheaval. . . . They have been called “mutations” and consist in a sudden jump upwards on the ladder of life — on the road of life towards God, to the great understanding of God and the close communion with God and to life in His spirit manifested through His law: True fellowship of all beings. It is a mutation like this that is now going to take place with mankind — a spiritual mutation. . . . The people . . . who are to acquire this spiritual mutation will come back to Earth in an entirely new light — with an entirely new knowledge and with the help from the outside, given directly by us, so that the Earth may once again become fertile and once again be able to produce the things the Earth was meant to produce. God’s spirit will be over every­thing and everyone. . . . Man will live so perfectly that he will be able to manage everything and everyone surrounding him in such a way that everything will be in peace and harmony. . . . There has been talk of perdition, but truly I say unto you . . . Nothing of that which has been created will be lost. The only forfeit there is will be the loss of possibility this time to achieve that level which a great part of humanity is to attain. But then, this is something quite different, I have explained that it is a spiritual purification that is about to take place on Earth, and he who does not fulfil the stipulations of the Law will be lost to this Earth — that is quite clear — but he or she will certainly not be lost to God. It is not possible to be lost to God. God is always with every human being — as well as with all other living beings. Life continues universally, life continues eternally — only that it continues elsewhere and on a level which the man or woman in question fulfils, hierarchically speaking. That is to say: Those who are now “lost” are lost in the way that they will continue their lives in accordance with their present terrestrial patterns — in some other place. However, wait and see when “my coming” is a reality, then you will not find it a loss after all. Just imagine yourself standing with a friend on the fourth rung of a ladder, and your friend suddenly takes one step upwards, while you remain on the same fourth rung; then, of course, you have been left behind as compared with him, although you are still there. There is no talk here of any “small step,” of any “modest development.” The modest development of Man’s spiritual maturity has been going on for thousands of years, and only a modest spiritual maturity has been reached. Now you are about to achieve the absolutely immense outlook — an outlook which mankind has not had before and has not been able to experience. This outlook holds possibilities for man in a way that will enable him to acquire knowledge so enormous that Man will have to have a certain carat of spirit in order to be entrusted with such knowledge. . . . This is a message of joy — a new birth, a new birth of Man’s spirit. It concerns people — not by the thousands, not by the ten thousands, not by the hundred thousands, but by the millions — who will be lifted up to a new rung which will condition a new way of life — where life will be lived under entirely different conditions, where life will be true happiness and one will feel grateful to have life. . . .
What is now going to take place is a fulfilment of the Law. Man­kind has reached knowledge which it does not control spiritually. It has reached so far that it is not able to continue along the road it has entered — and survive. But Man has his free will and for this reason he has been permitted to go this far — and for the same reason, he will be permitted to go to the extreme limit. Man will be allowed to stage everything that he has created in his misunderstanding. He will be per­mitted to turn the hatred against himself — he will be permitted to be smitten by the hatred which he himself has built up on all sides of him­self. This will result in the most terrible things happening to man­kind — this will result in an all-comprehending atomic war where much distress and suffering will arise. As the law does not permit anyone to interfere in the universe, we will not interfere. On the other hand, help will be given to mankind — among other reasons, because Man himself requested this help and because many people on Earth have consented to accept this help. But this help will only be given to those who have voluntarily consented to it. When desperation reaches a climax, we will come from Space in a way which mankind will be able to grasp and understand — people will see us, hear us and feel us. We will stop like the lightning — it will happen from one second to the next. Simultaneously, we will mass-evacuate the people remaining on Earth, mass-evacuate them up into gigantic space-ships that have been constructed with this purpose in view. Everything within this operation has been thoroughly calculated, everything has been carefully planned. . . . After the evacuation has taken place, the tipping of the Earth will happen. The Earth will undergo a total change — its present surface will change totally. People will not recognize their Earth again — they will simply have to manufacture new globes. The tipping itself will only last a second, it will be as quick as that, lightning-like. When it is over, it will be possible to cleanse the atmosphere of the impurities put into it by mankind. Then, life will again be possible on Earth, and then, life will return to Earth. . . . The plants will soon sprout, animals and birds will reappear, and man­kind will be given another big helping hand — in the reconstruction of their Earth. Within six months, most of it will be rebuilt in such a way that life may be continued in a way befitting Man — in an entirely new way. At the same time, Man will be admitted to Space travel and he will learn about things he does not know today, he will learn how to do things he does not master today, and he will be given things from the world outside which he today hardly believes exist. . . . It is a new birth that is now to take place with large parts of man­kind and therefore, it is a message of joy — even if other large parts of mankind will be transferred to other planets to continue their lives there. . . . The difference of class, hierarchically, between Man as he is today and those of tomorrow who have made the step, will be just as big as is the (hierarchical) difference between Man and animal today. Then you can understand how high Man is to ascend on the ladder of hierarchy. It is a giant stride Man is to make; but I tell you: If Man had lived by the words of God by his own free will, my Second Coming would not have been necessary. It is impossible to lie to us as to whether it is shallow talk, or it is at the bottom of your heart that you wish to comply with God’s law. But he who really means it shall have his Karma cancelled and be taken along into the world that will now be given to those who continue their lives on this Earth. And I have said that if a Man turns round, even in the very last second of this Age, he will be taken up. This is according to the principle of Grace. By His own free will. God then rehabilitates this man. Man on Earth has not been able to live by God’s law, to manifest God’s law in his daily life. But many, many individuals have tried through sincere endeavours if they could change this state of affairs with themselves and among themselves . . . there are so many people on Earth today whose qualities are so good that they can make the basis of some­thing greater, and therefore about one-third of the Earth’s population today have already qualified to continue their lives here. The others have still got the offer, and they will have the chance of changing their ways and thinking — right to the very last minute. I have told you this before, … if only you acknowledge God’s existence, if only you accept the name of God and accept the existence of a “God’s Law” and sincerely wish to comply with it — then the help will be given, then it is enough to continue life here, for the necessary understanding can be obtained with a little help from us. As to false prophets, . . . there have already been quite a number of them . . . only those who profess love — the principle of Limitless Love — are not false prophets. . . . Not until you are able to forgive others will you have forgiveness yourself. . . . But let me repeat: Only those who profess Limitless Love arc not false prophets. That is how it is. It is a message of joy that has now been given to Man, and it is a message of joy, considering the fact that all life on Earth would come to an end, if no help were given — a help provided by virtue of a spiritual manifestation which by far exceeds what Man himself represents. Many people have asked about the qualifications, spiritually, which are necessary for a man to obtain eternal life, for a man to obtain his share of the life now to be established on Earth. I have told you that it is a question of understanding of the principle of LOVE and I have said that it has nothing to do with what people usually think is knowledge. For example, if a professor thinks he can ignore his God into physical matter, he has not got a chance. But, at the same time, if a simple peasant believes in his God, he shall be saved. The mere acceptance of God’s name is sufficient. . . . I have explained that around every human, there is an electromagnetic force field. Your scientists know about it. They know that electric impulses flow through the human body. The electro­magnetic force field is what you term “the Aura.” It can be measured and registered. The frequency of the Aura is an exact reflection and guarantor of the spiritual qualities of the man in question. Therefore, no mistake on our part will occur. The good that we bring to the Earth will be given only to those who represent such spiritual qualities that they may be entrusted with it, and who will be able — by their own free will — to conform with the laws of the hierarchy or the Laws of God. They alone will be admitted into the New Age now awaiting you. . . . I have said that well over 1,000,000,000 [one billion] do qualify already to be taken up; but I have also said that it is the fate of 2,000,000,000 [two billion] that is now to be decided. This is to be understood to the effect that even he who reverses his ways and thinking only in the very last second will be taken up. This is a message of joy being given to all mankind. I have likened it to a birth: It is a new birth now to take place with millions and millions of individuals . . . it is a spiritual mutation that is to be given to the part of mankind who will continue life on Earth — and at the same time, I also said that nothing which has been created will be lost. . . . Man has done things in the microcosm which are, in fact, a serious breach of the Law. Man has broken the atom, and that is not allowed. Microcosm and macrocosm belong closely together; therefore the fire will now come over Man. He has created it himself in his misunderstanding. But it is a message of joy that today, so many people will be able to conform with God’s law and therefore can be given eternal life. Many people, perhaps, will protest that there cannot exist any God, Man’s conditions and circumstances being what they are. If there were a God, he would not permit such circumstances as are now found on Earth. . . . Man has got a free will, and without a free will, evolution would not be possible. And because God has given Man a free will, it is not God but Man himself who is to blame for the predicament in which be finds himself today. God was fully aware that such situations might occur — and would occur on some planets; but God looks upon life with eyes that are quite different from Man’s. Man does not believe in a life after death in the literal sense of the words. God knows that life is eternal; God knows that those who die do continue in life. They live on with their sufferings until they realise for themselves that the spiritual values and spiritual powers — which every human possesses — must be used correctly; and this is where you are to seek first of all, and if you seek and find your God in the right way, your sufferings will simply come to an end. This has been told to Man for thousands of years, and it is not God’s mistake that Man will not listen; it is Man’s own fault. . . . May they believe it or not now, someday, on their way through Life, they will realize. . . . Some people can have their Karma cancelled quickly; many will have to go on with it, depending on the way they react to the situation they are now facing — whether they are able to turn their hardened minds outwards and upwards, thereby realizing the Divinity of the Universe and the Divinity of themselves, thereby also realizing their own worth as God-created beings — at the same time respecting other people’s dignity and worth and the worth of all living beings. …As long as people cannot practise TRUE LOVE towards one another, it is not God that is wrong, but actually those who are not able to demonstrate the Principle of LOVE, the principle of loving one’s neighbour: “Do unto others as you want others to do unto you” — so simple as that! Living your life, you will find that day follows night, and you will see that it is a natural law that there must be darkness before there can be light. Today, Man is in the dark — Man is living in spiritual darkness. Man’s mind has become darkened, and therefore also, Man’s sky or Man’s horizon is dark. But he who will hear, and he who will listen, will already now see the dawn and realize that a light will soon overshine the darkness in which Man finds himself today. A Light will shine, so beauti­ful that Man has never seen its like before. Literally, the sky will shine and the sun will be changed, but the spiritual light that Man himself will radiate will be of such a quality and such a strength that every man will be a light for his fellow men. And when you throw light like that, before each other and on each other, in the future world of which you are now seeing the dawn, then Man will attain full light, full vision and full understanding. There are many questions in connection with this operation, and it is quite understandable that people ask: Well, but I myself and those who are close and dear to me — have we got any chance at all of being admitted into the New Age? It is a pertinent question, and we do understand people worrying about it. . . . You must understand the situa­tion in which we find ourselves. You must try to raise your conscious­ness all the way up to the level where we are. Then you will, after all, view the whole situation with different eyes, for I have told you that nothing that has been created will be lost, even if only those who qualify will be taken into the NEW AGE. The others will be replaced. This does not involve physical transportation, however. It is a matter of reincar­nation on a planet with the same pattern of evolution as the Earth. This must not confuse you, and you must not worry; for they will reach the next level too, sooner or later. The spiritual mutation which is now to be given will cause that all cells of the human brains will be available for use. This means that Man will come closer to God and the Kingdom of God, because Man will then be able to understand God and the Kingdom better. Then you can also understand that if — with such an enormous consciousness — you do not live in accordance with the principle of Love, it will be impossible to go through with life. During the last days and last hours, . . . all mankind may become aware that universal powers are on their way to help Man. . . . Our help will he effective and be given in a way that will leave no doubt that it is a help that is being given to those who want it — it must not be interference, it must be help — . . . let me repeat: Nobody who will listen to this message, and nobody who will turn his mind to God, to Cosmos and to the Universal Law, will feel lost or forsaken — nobody! I have said that I shall take you by surprise, and the suddenness with which the events will happen will surprise you. . . . The message is a message of joy, and I wish that it be treated as a message of joy. Serious events will strike the Earth, this I have told you, but I have also told you what will be the outcome — that they will end in my Second Coming. And this is what should be stressed. Speak of the spiritual side of the matter more than of the violent part of it. Violence does not belong to us, it belongs to Man; but violence will come to an end for Man now. Confusion begets confusion. Only he who will not receive confusion within himself will escape confusion. Therefore I have said: Do not allow outer things to disturb your innermost being; and it will apply now, more than ever before, in the situation in which you will come to stand. Find peace and harmony within yourselves; for only through inner peace and harmony will you be able to attain the spiritual strength that will be necessary during these latter days of the Earth. It was a joy to receive and read your letter dated 25th August 1977 sent to my old address. I had shifted to the address printed above in 1971 April. However letters addressed to my old address do reach me, somewhat late. I had received printed and cyclostyled literature from UNIVERSAL LINK, (Borup Spiritual School) 4140 Borup (Denmark). What I was sent were English translations of the messages (original in the Danish language). Naturally, the English translations were somewhat bad English, but we could understand the real spirit and import of what were conveyed. I took the opportunity of printing the APPENDIX just to show the SIMILARITY to Meher Baba’s utterances, such as “three fourths of the world being destroyed”, “Rejoice, something great will happen that has never happened before”, “New Humanity” “LOVE”, etc. I avoided direct references to MEHER BABA as “THE NEW MESSIAH” and “LIMITLESS LOVE” in quoting, but only mentioned at the commencement of the APPENDIX. The atmosphere is that all Baba-lovers (including the close Mandali) are only attached to the physical form of MEHER BABA and are not so elevated spiritually to realise that the same GOD ALMIGHTY, COSMIC LOVE OR COSMIC PRINCIPLE can work in different places in different names and in different countries and that there is a universal HIERARCHY or LINK and all the Physical appearances of GOD work together and are in communion on planes different from ours and which we cannot grasp—unless we are also like them. Meher Baba was in such contact. When the book was sent, the Mandali were vehement that I should not have “spoiled the book on Meher Baba with something unconnected with Baba”. I felt rather depressed and that all the zeal and earnestness of my purpose was damped and asked the Mandali to ask Baba and let me know (i) if I should destroy the booklets, or (ii) delete only the Appendix, or (iii) go ahead as I had printed. I got a telegram that I should go ahead. This rather was not to the liking of the Mandali and later I got instructions that the APPENDIX may not be published in the Translations in the Indian languages and that in the next Edition I may drop it. This, I construe, as Meher Baba’s usual ways of not making anyone displeased. He also knows that most of His followers may get confused since they know NO OTHER GOD THAN MEHER BABA. I was getting the Messages from 1968 till 1973. I was then informed that the work stopped owing to financial difficulties and lack of proper men to translate and publish and also perhaps some differences between the persons handling. I did not get thereafter. So far as I was concerned, I was willing to remit money but the Government regulations in India prevented me from remitting to foreign countries. However, I propose to write again to see if there is any response. If you really like to appreciate the whole UNIVERSAL LINK I would like you to read the MESSAGES (literature) I had received. I have no spare copy and so, I can send you as a loan for you to read and return them to me safe. I don’t grudge the airmail postage, since it is really worth it. In the meanwhile, I have sent you today BY AIRMAIL PACKET two copies of the Booklet that you saw at Myrtle Beach. I also send also the references to MEHER BABA in two of the Messages. You would understand them much better on reading the entire . . ..